Deco mesh wreaths are all the rage these days. They’re a fun way to decorate doors during every holiday season. I’ve seen them in craft stores and online selling for $25 to $100 — or more. Let me show you how you can make your own deco mesh wreath in very little time with just a few supplies. I’ve made deco mesh wreaths for just about every holiday. 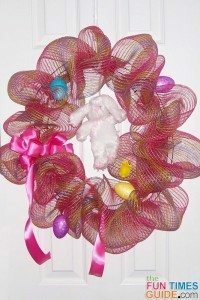 Since Easter is the next upcoming holiday, I’ll use my Easter deco mesh wreaths for this tutorial, but you’ll see some of my wreaths from other holidays as well. What Is Deco Mesh Like? So what exactly is deco mesh? While it’s sold on a roll and often called deco mesh ribbon, it’s not exactly ribbon. It’s stiffer than ribbon — kind of like burlap. It’s pliable, but will not hold shape the way a wired ribbon will. Deco mesh comes in a variety of colors — from solids to stripes to plaids — and you can use it to create a wreath for any holiday or special event. 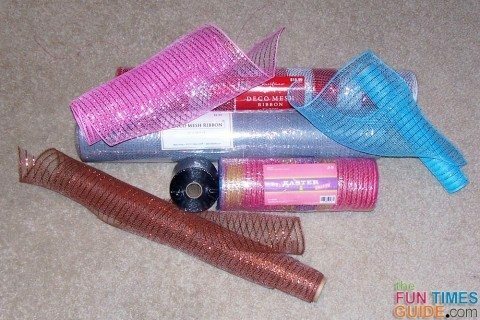 You can find it at craft stores (such as Michael’s and Hobby Lobby), stores that sell craft supplies (such as Walmart or Target), and online. It’s usually labeled as floral or holiday and priced accordingly. It’s the exact same product, so watch for sales in either department to get a good buy! TIP: You can add any number of embellishments, based on the theme of your wreath and your personal preferences. For example, on my Easter egg wreath I added a plush white bunny, large bow, and small yellow chicks. I’ve seen beautiful wreaths with nothing but deco mesh, as well as nice wreaths with many added features. Search Pinterest and Etsy for inspiration. Each wreath requires 2 layers of deco mesh — which is great for using 2 colors if you want. I suggest coming up with your basic mesh color(s) first, and then choosing different embellishments to add after you are done with the mesh. 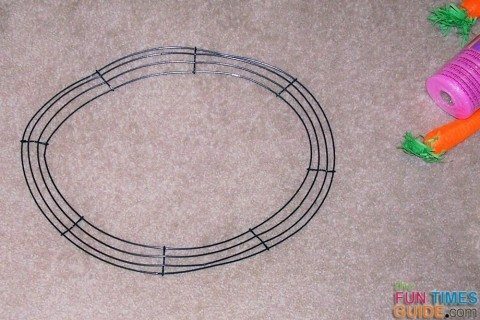 Deco mesh is sold in widths from 2.5″ to 21″, and wire frames (often called box wire wreath frames) come in many sizes. Determine how big you want your wreath to be and buy a wire frame in that size. Keep in mind, it will be bigger once you add the mesh. TIP: Some stores sell frames with pre-tied pipe cleaners (often called a work wreath), and you may decide that will work for your project. Be sure the ties will match the deco mesh you plan to use. The width of your mesh should correspond with the size of your wreath — meaning a larger wreath will need wider mesh for the best coverage. When I was working on this reindeer Christmas wreath, I used a 24″ frame and wanted to use the widest mesh of 21″. I could not find brown in that width, so I used 18″, and it was just fine. One roll of the 21″ mesh would be enough to make one 24″ wreath, but I bought (and used most of) 2 of the 18″. Since each wreath will vary based on the size of your loops and can be different, I recommend buying 2 rolls of the color you choose, opening the second one only if you need to, and returning it if you don’t. If your wreath will have 2 colors of mesh, get one of each color in the same width. The pipe cleaners should be the same color as your mesh, or lighter. Use the best color you can find if there is not an exact match. …And now you are ready to begin! For this Easter wreath, I used an 18″ round frame that I gently pressed into an oval egg shape. Next, cut 8 white 12″ pipe cleaners in half. 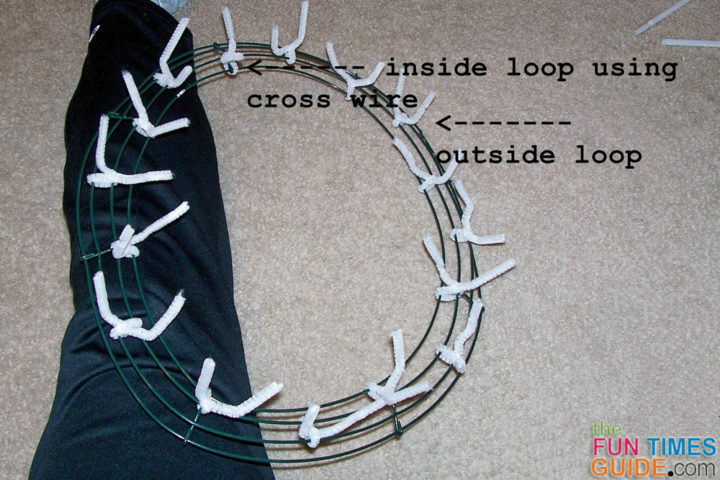 At each cross wire, twist a pipe cleaner so it goes around all 3 wires, pointing up. Always twist your pipe cleaner the same way. For example, if you look at the 2 middle wires going around and the short cross wire like a percentage sign… bring one end of the pipe cleaner up at the top left, and the other end at the bottom right, and twist them together clockwise 2 or 3 times really tightly. Move all the way around the frame doing the same. When you’re done, move to the 2 outside wires. (This will be the same if your frame has 3 or 4 wires going around.) Halfway between each cross wire, repeat the twist tie procedure — all the way round. The pipe cleaners need to be twisted really tightly, to prevent them from sliding around on the frame. But don’t worry, that’s just a precaution. There won’t be any sliding once the deco mesh is on. When all of your pipe cleaners are twisted on, start unwrapping your mesh. It will help to have about 2 feet of mesh unrolled at a time, but not too much more than that, because it tends to grab onto things (even itself). Twist the pipe cleaner 2 times around your mesh, in the same direction as you did originally. Leave the ends pointing up until you are done adding all the extra decorations. Pinch the mesh again about 10-15″ from the twisted section. Bigger sections will result in bigger loops, and you can choose the size based on your preference and the size of your frame. I like to use 12″. You will want to make sure each section is the same size, but there is no need to actually measure it as you go. You can have a ruler handy — placed right under your frame — to use as a guide. Continue all the way around the outside edge, using every pipe cleaner. Don’t worry about how the loops are looking at this point, you are going to fluff them into shape when you’re all done. You’ll want to make one more loop on the outside edge, using your first twisted pipe cleaner to hold down this last one as well. It will be very tight when you twist, but you can do it! Cut off a 6″ tail of mesh. Turn the frame over, looking at the backside. Your two 6″ tails should be close together… tie them into a knot. The mesh won’t allow for a super tight knot, so just do the best you can. Then tuck the edges under the wires of the frame. Begin with your second color on the inside loop — starting and finishing the same as before. If you are continuing with the same color to the inside loop, move in the same direction around the frame to the next pipe cleaner on the inside edge. Use about 2″ more on this loop only, as it will have to cover a bit more of the frame. Go back to the original amount of mesh as you continue around the frame. Finish off the inside loop just the same as the outside loop, tying your 6″ tails in a knot on the back. And you’re nearly done! Back on the front of the wire frame, pull and twist the loops of deco mesh so they form an even appearance all the way around. It will help to hold one outer loop and one inner loop and pull them together in opposing directions (outer loop pull towards the inside of the frame; inner loop pull towards the outside). 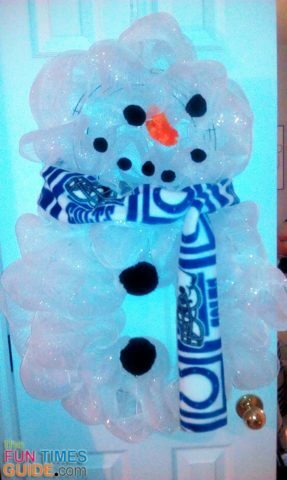 This will also help to cover the pipe cleaners. 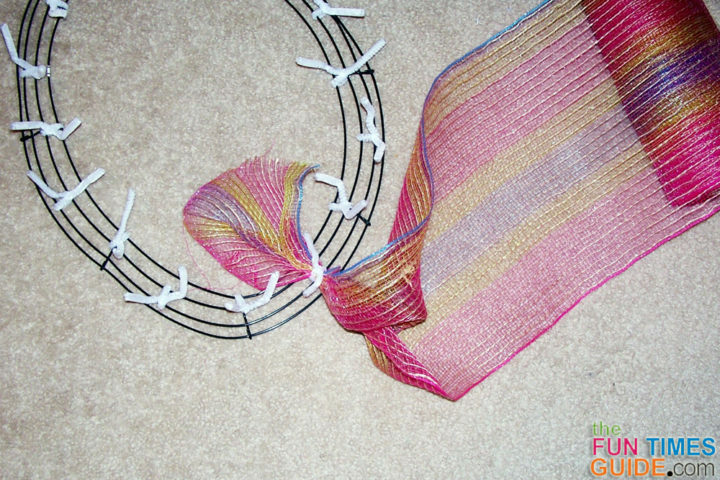 When you’re done, look to see if any part of the wire frame or any pipe cleaners are exposed. If so, tug again on the loops in that area until everything is covered. You can now decorate the frame anyway you like! 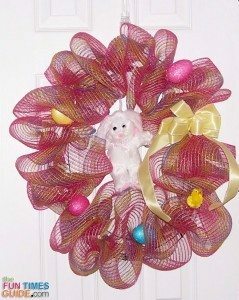 For my Easter wreath I used eggs, chicks, and a white bunny that I found at the dollar store. As you can see, I started out with several embellishment options and decided not to use the carrots or green grass. The eggs have a bow on them, and I hooked a loop through a pipe cleaner and twisted it closed. This is why you always want to twist in the same direction, so you won’t accidentally untwist your earlier twist! I tucked the feet of the little chick into the mesh and secured it with a dollop of hot glue. To attach the bunny, I used half of a pipe cleaner to form a tight loop around the bunny’s neck. Twist one end of a pipe cleaner around the back of the loop, and hang the other end from the top of your frame. Play with it until the bunny is hanging in a good place, and then twist the other end onto the frame. It will swing freely when you’re holding the frame, but it will lie flat when you hang it on the wall. Speaking of hanging your wreath on the wall… use half of a pipe cleaner to create a twisted loop on top of the frame for hanging on a wreath hanger or nail. Be creative and use anything you can find at the craft store or from your own craft stash. 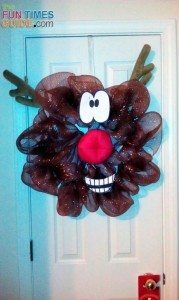 You can always hot glue a pipe cleaner to the back side of ANYTHING and twist it onto the wreath. Don’t forget to look around Pinterest and Etsy for embellishment ideas. Those 2 sites are always a great source of inspiration for me. 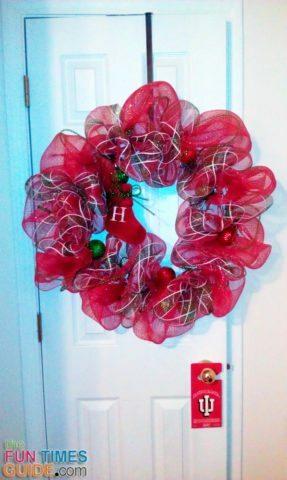 As stated earlier, deco mesh wreaths can be made as holiday door decorations for any holiday or special event. New Year’s wreath… all types of party favors work great in this wreath. Valentine’s Day wreath… try a heart shaped deco mesh wreath!